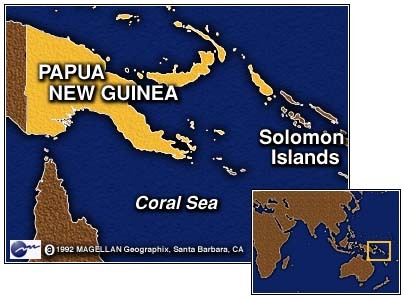 PORT MORESBY, Papua New Guinea (CNN) -- At least two people were killed and thousands of villagers were evacuated Wednesday from the Papua New Guinea island of Manam after a volcano spewed plumes of ash and lava high into the air. There was an unconfirmed report of a third death. Hours after the eruption, lava flows snaked through the forests of the South Pacific island, destroyed the village of Buduwa and poured into the sea, making evacuation efforts extremely hazardous. "It's very difficult for the vessels to go in, so (villagers) are going to have to be taken out by small boats," said Leith Anderson, director of the National Disaster and Emergency Services in the capital Port Moresby. 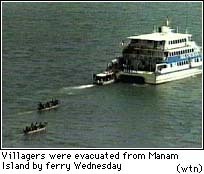 By Wednesday evening, some 1,500 villagers had been ferried by boat nine miles (15 km) away to the Papua New Guinea mainland, an officer for the Madang provincial government said. The injured were being treated there for burns and other wounds. He said some 1,000 other villagers would be evacuated. Provincial government officials said only villages in the path of the lava were being evacuated. There are a total of 7,000 people on the island. The volcano's last eruptions were in 1991 and 1992. 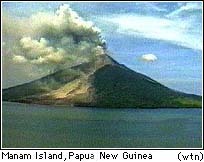 Papua New Guinea is on the Pacific's volcanic belt called the "Ring of Fire." Emergency services on Manam had been monitoring the volcano for the past month, but declared a stage-four alert Tuesday night. In 1957, the village of Buduwa was relocated after it was destroyed by a volcanic eruption.